Bill Griffith is one of the great cartoonists and storytellers. I've been a fan for decades, both of his absurdist "Zippy the Pinhead" syndicated comic as well as his one-page comics of cultural criticism, "Griffith Observatory." 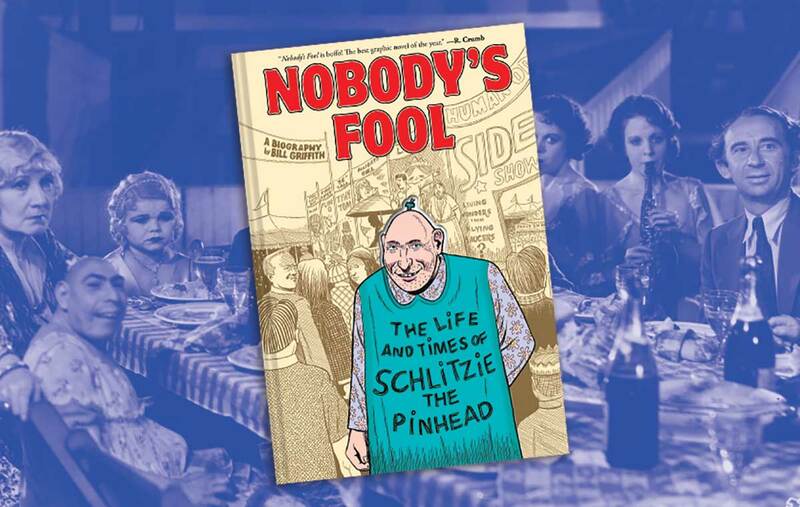 His latest book is Nobody's Fool: The Life and Times of Schlitzie the Pinhead, a 250-page hardbound comic biography of "Schlitzie the Pinhead" (1901-1971), who served as the inspiration for Griffith's fictional Zippy. Schlitzie, who had microcephaly and was sold by his parents to a traveling sideshow when he was eight years old, is best known for his role in the 1932 movie, Freaks, directed by Tod Browning, which starred real-life "freak show" circus performers. The disabilities of the performers were too shocking for audiences and the movie was banned in many places. I saw Freaks in high school (around the same time I was reading Very Special People) and was utterly fascinated by Johnny Eck, who didn't have a lower body but could run very fast using his arms, and Prince Randian ("The Human Torso") who had no arms or legs but could use his mouth to roll cigarettes and to shave with a straight razor. Griffith spends a good portion of the biography on the making of Freaks, and Schlitzie's life during that time. Griffith exhaustively researched Nobody's Fool, interviewing Ward Hall, his sideshow manager, Wolf Krakowski, a musician who worked in a circus with Schlitzie in 1965 , and others who knew Schlitzie. Griffith includes his own story of watching Freaks for the first time in 1963 as an art student and being deeply affected by the movie and its stars, especially Schlitzie. The result is a vibrant, energetic, sad, epic story that drops you into the American sideshow of the mid 20th century, a strange world that has all but disappeared. Enjoy these sample pages selected for Boing Boing by Mr. Griffith. People with a Wikipedia article about them usually resign themselves to living with an error-ridden, lopsided version of their life and work as a top search result. Artist Adrian Piper took matters into her own hands after numerous attempts to get hers corrected, rebuilding hers on her own site.